Amy Beth Segal, a 34-year-old graduate student in the Sloan School of Management, died of cancer at the MD Anderson Cancer Center in Houston on July 21. Ms. Segal, a resident of New York City, had been receiving treatment for her illness at the Houston medical center which is near the home of her sister and brother-in-law, Mara and Scott Van Nostrand. She came to MIT in 1992, after earning a bachelor’s degree in labor relations from Cornell University and a master’s degree from the London School of Economics. She was in the final stages of completing her PhD in organization studies at the time of her death. Her husband, Jeffrey Feinsod of New York City, said that Segal had accepted a position as assistant professor at McGill University in Montreal prior to her illness. First diagnosed with a rare lung sarcoma last fall, Segal had surgery in September and underwent subsequent treatment during the past ten months, while continuing to pursue research for her PhD thesis despite the serious nature of her illness. Her thesis work was considered unique in its philosophical and methodological stance, as well as for its “honest portrayal of the emotional side of organizational life, for extending the boundaries of theories of feminism and organizational change,” according to a statement by organizers of a scholarship fund being set up to honor Segal. The group hopes to raise funds to hire a writer who will work with Segal’s colleagues to finish her dissertation, and to offer a bi-annual scholarship to women students at the Sloan School. Ms. Segal graduated from high school in her hometown of Oradell, NJ. She is survived by her husband; her parents, Judy and Paul Segal of Oradell; her sister; and twin nieces Alanna and Zoe Van Nostrand of Houston. The family requests that donations in Segal’s memory be sent to either the MD Anderson Cancer Center Development Fund-Sarcoma Research, 1515 Holcombe Boulevard, Houston, TX 77030; Gilda’s Club NYC, 195 West Houston Street, New York, NY 10014; or the scholarship fund. 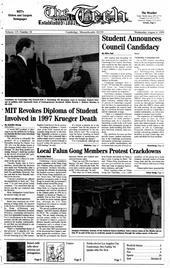 For information about the scholarship fund, contact Sandra Rothenberg at <srothenberg@alum.mit.edu>.